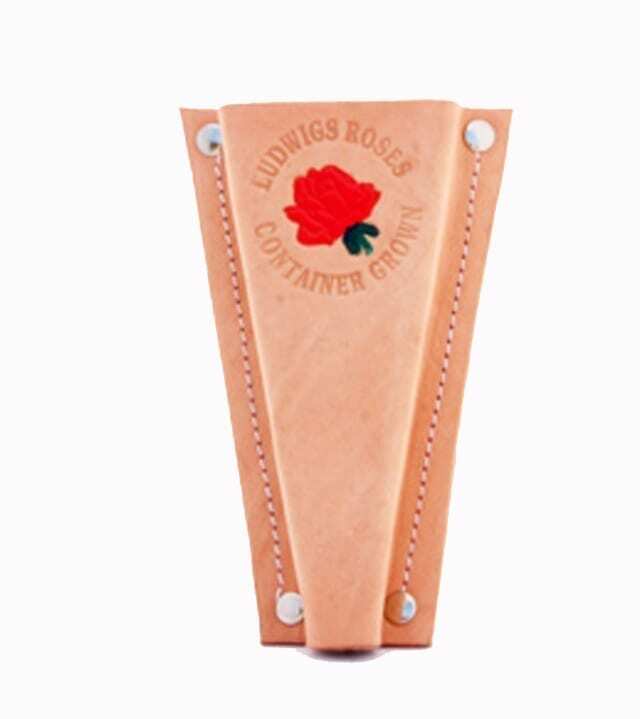 Roses rejuvenate themselves by producing new stems from the base on a regular basis. 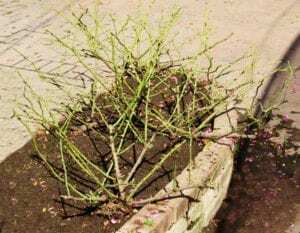 Left unpruned, roses eventually carry out their own pruning by not nourishing the thinner inside growth, which slowly dries out completely and dies. 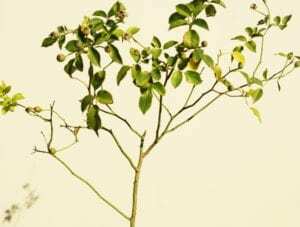 In this case, new basal stems either push their way through the dead growth to flower higher up in the full light, or push up on the outsides of the bush or shrub, which becomes broader over the years. 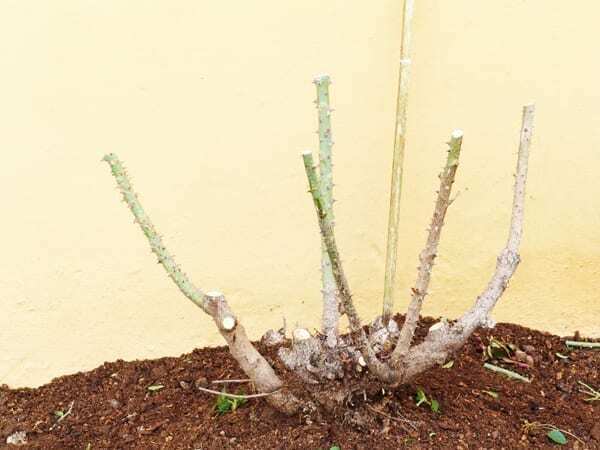 Watch these clips to see how easy pruning is. Remember, you need not fear hurting the roses by cutting them back, they love it. It is like having a hair cut to them. 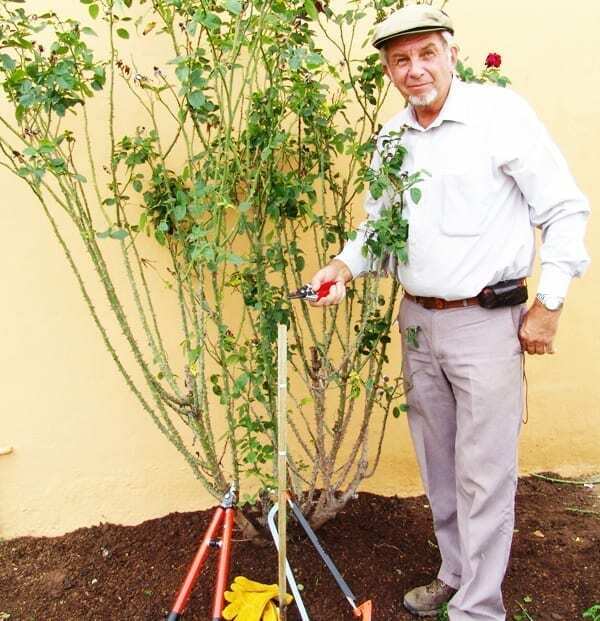 Watch more of our videos on how to prune the different types of roses by following this link! We prune roses to maintain the shape of the bush, to keep the main branches to a manageable height, and to eliminate unsightly, superfluous dead wood. 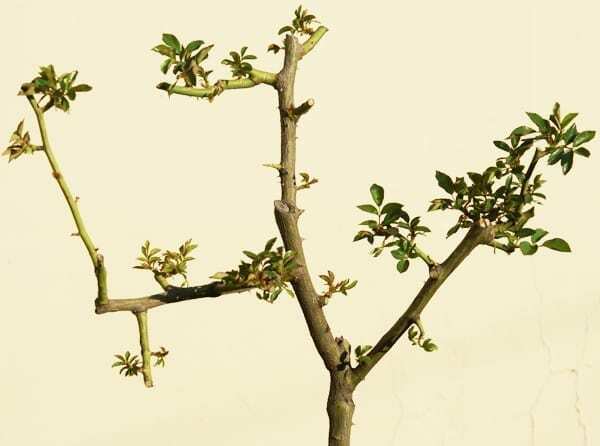 Pruning encourages strong new growth and reduces the number of flowering stems, resulting in an increase in eventual flower size. Pruning should generally take place from mid-July until the end of August, with local weather patterns helping to pinpoint the time more exactly. For most parts of the country, the best time to prune is during the latter part of July. In warmer regions, such as the Lowveld and coastal KwaZulu-Natal, pruning can, if desired, be carried out by the end of June. In very cold regions pruning is delayed – it might vary from the first week in August to the last week in August in the really cold parts of the country. Bear in mind that pruning encourages sprouting even during fairly low temperatures. Newly sprouted leaves are tender and could be burnt by late frost, in which case nothing is gained and important stored reserves are lost. In general, roses cannot be induced to flower earlier in spring by pruning early. However, delaying pruning by two to three weeks can result in a slight delay in flowering, possibly by up to a week. 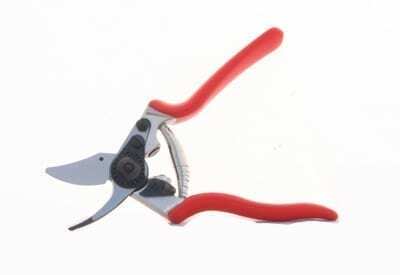 Pruning shears must be in good condition, as sharp blades make the job much easier. Blades can be sharpened with a new sharpening device available from most garden centres. Make sure to sharpen mainly the slanted outside of the blade and only very little on the flat inside. Continual sharpening of the inside will eventually create a gap between the blades. If there is play between the blades, tighten the centre nut gradually until the two blades are squeezed tightly next to one another. Before tightening the nut, allow a few drops of oil to penetrate between the two touching parts around the centre bolt and into the spring. Using long-handled loppers of good quality, you can prune all types of roses without the assistance of a saw. The same principles of sharpening and of keeping the pivot bolt and nut tight apply to long-handled loppers. Gloves, available from garden centres and hardware stores, make pruning more manageable, whether they’re long-sleeved welding gloves or short gardening gloves. For accuracy and neatness, make a pointed measure stick of about 1 m in length. Make a mark 10 cm from the point, which is the depth that it is to be pushed into the ground. Make a further mark 50 to 70 cm (according to personal preference) up from the first mark and cut off the stick at 20 cm above the second mark. 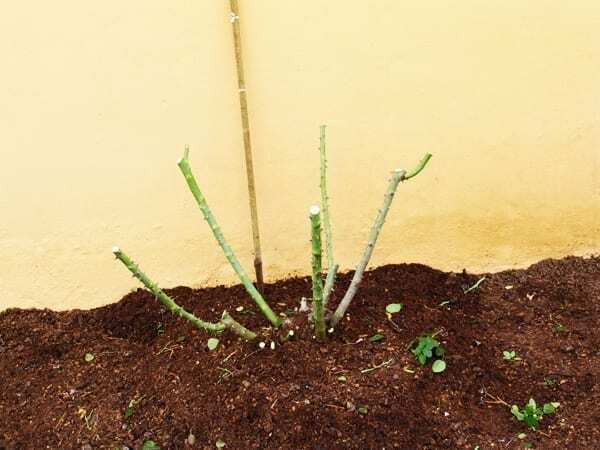 Push the (above mentioned) measuring stick into the ground next to the bush to be pruned, and cut off every branch and stem in line with the top of the stick (70 to 90 cm above ground level). 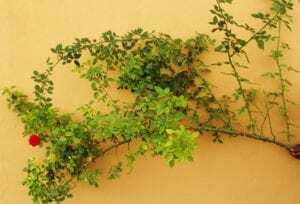 With the top growth and twigs removed, it becomes easy to inspect the bush and to select the main stems or branches that are to remain. The maximum number of stems or branches to remain is four and the minimum one. 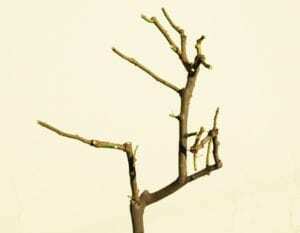 ‘Branch’ means a fairly thick wooden member that has branched more or less at the base and is two years or older. A ‘stem’ is this season’s wooden growth from the base. 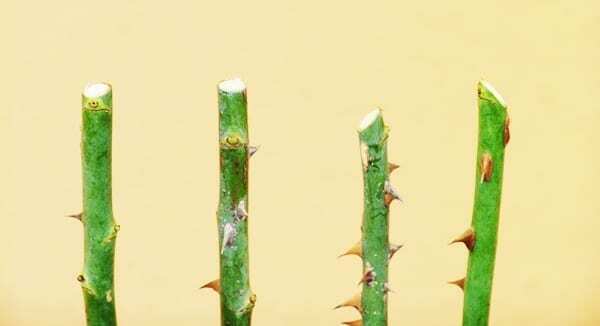 The colour of the thorns helps distinguish between this season’s stems and older wood. 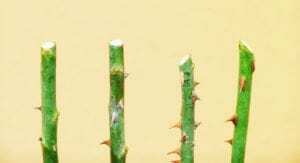 Thorns turn grey on old wood, but are usually still brown or reddish on this season’s stems. The bark, too, is grey and thick on older wood. First identify four suitable stems that are more or less neatly arranged in diverging directions. Remove all other stems and branches. 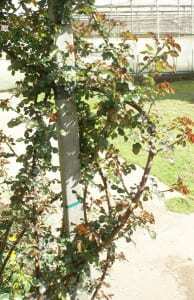 If there are only one or two good stems, it is possible to retain some of the older branches. If the situation is not clear, start at the centre by removing older branches that are obviously in the way. 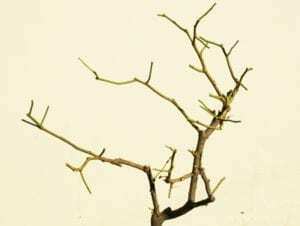 However, if the branches do not look as if they could sustain new growth, cut away all older branches, retaining just one good stem, which should, ideally, be more or less in the centre. From this single good stem you can expect five to six good blooms, and alongside it, the development of new basal stems. Once you have selected the stems to remain, and removed all other stems and branches, check the measuring pole again, and cut the remaining stems at the mark that is 20 cm below the top. All remaining branches should be cut at the same height, give or take 10 cm, but not more. Remember that the root system will favour taller stems to the detriment of lower stems, a trend known as apical dominance. The direction of the top eye is of minor importance – the rose will decide which eye to favour. The actual final cut should be at 90° to the stem. 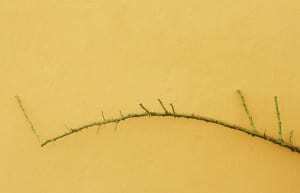 This is the smallest wound and since the stems are almost never absolutely vertical, it means that the cut is also not horizontal and will not collect water. When cutting, make sure that the thick blade is facing up and is pointed away from you. If the thicker blade faces downwards it will bruise the stem severely. Another trick to make cutting easier is to grip the branch or stem well above where the cut is to be made, and to push gently away from the cutting blade of the shear. Very thick branches require vigorous pushing. Pushing stretches the wood and makes it softer to cut. If not familiar with this method, practice it higher up on the stems until you get the feel. If pushing is not synchronised with cutting, the branch might split. Pulling the stem backwards over the blade will make cutting almost impossible. The same technique applies to cutting very thick branches with loppers, where one can either use a foot or knee to push, or ask an assistant to help. 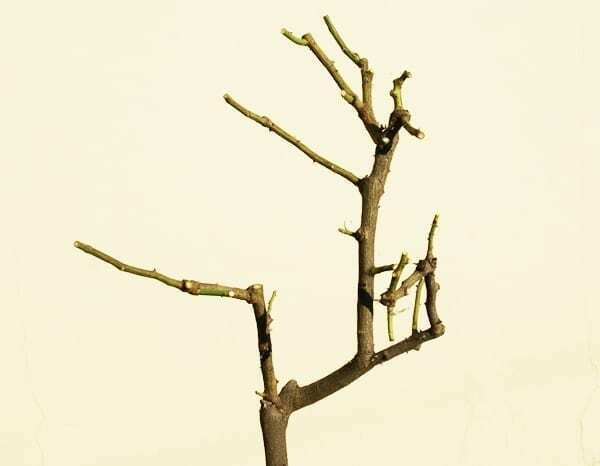 Once the remaining stems have been pruned to the specified height, any side branches on these stems should be cut off smoothly next to the main stem. If any of the main stems is forked, remove one tine of the fork. Remaining stems should be separated from each other at the top by at least the length of the shears (about 20 cm). Commence with the next bush. It gets easier all the time. However, no two rose bushes are identical, and adjustments have to be made. Where a bush is much weaker and shorter than the others, it is advisable to cut back such a bush more severely than the others. Much taller bushes are usually simply brought back to the standard 50 to 70 cm. They will grow as tall again, and as quickly. 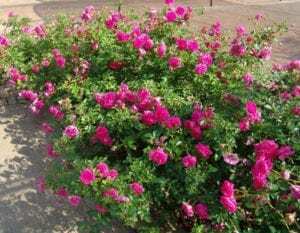 The above method applies to Bush roses planted in beds, in groups and rows. 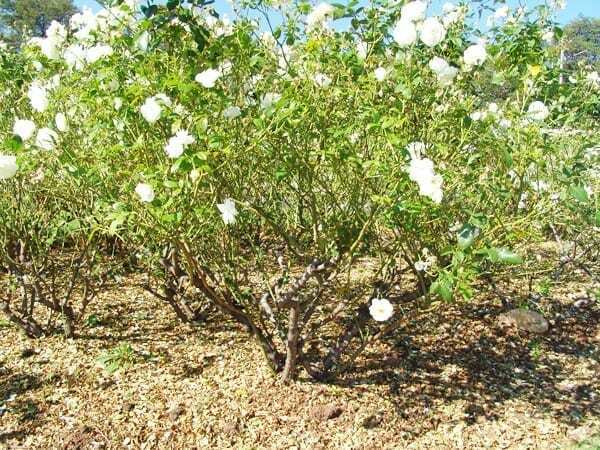 Bush roses that are planted as single specimens or further apart than the recommended 50 to 80 cm, have more space to develop and can be pruned more lightly. This entails cutting them back to about 1 to 1,2 m. It still helps to remove growth, and particularly old wood, from the centre of the bush. 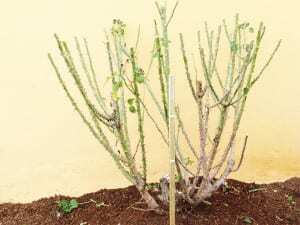 Leave no more than four main branches, but allow substantial side stems on the main branches to remain, usually cut back to a length of about 20 cm. Such lightly pruned roses will produce quality blooms in October. Rose bushes that are pruned lightly every year form very thick wooden stems and have a tendency to remain bare – without foliage and flowers – at the lower part of the bush. These are simply very tall Hybrid Teas, whose growth is formal and upright. They are planted for the purpose of screening or providing colour high up as a background. 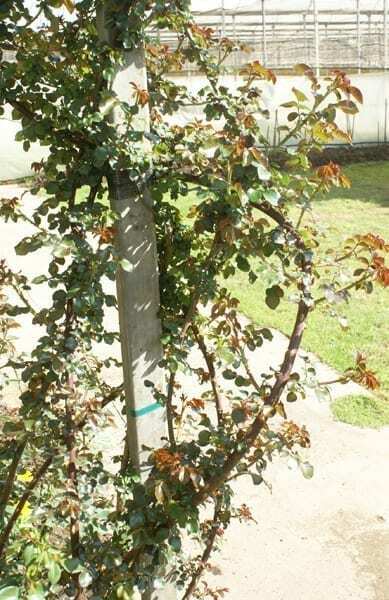 Prune Spire roses to chest height (1,3 m) and lop off all branches at this level. Then remove all surplus branches from the centre, again leaving not more than four main branches. When it comes to cleaning up the remaining main stems or branches, leave some of the stems on the upper level. Make sure that the tops of remaining stems are spaced about 30 cm from each other. There are two ways of handling this group of roses. They can be pruned more or less like Spire roses, which will encourage strong new stems and large flowers in spring. 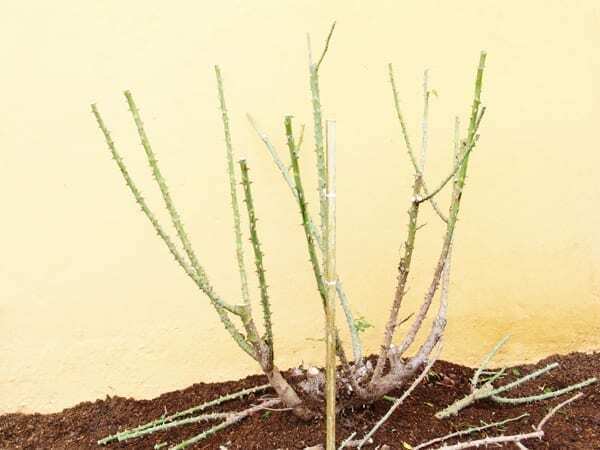 However, if the graceful, arching habit of an informal shrub is required, do not cut off the shrub at a certain height but rather start by identifying the younger, better stems, and then removing older wood at the base. 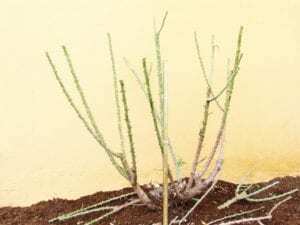 Since growth is usually very dense, it is advisable to pull out each main branch as it is cut, and then to re-check which other stems can be removed. Space must be created for new growth in the centre of the shrub. Cut back long, arching canes to where they start growing horizontally, as last season’s hanging stems will not give rise to quality blooms. However, the weight of new growth and flowers will recreate the arching effect. Again, all or most of the shorter side stems are cut off smoothly next to the main stem. Some Climbing roses grow to such size and profusion that it becomes an impossible task to prune them. 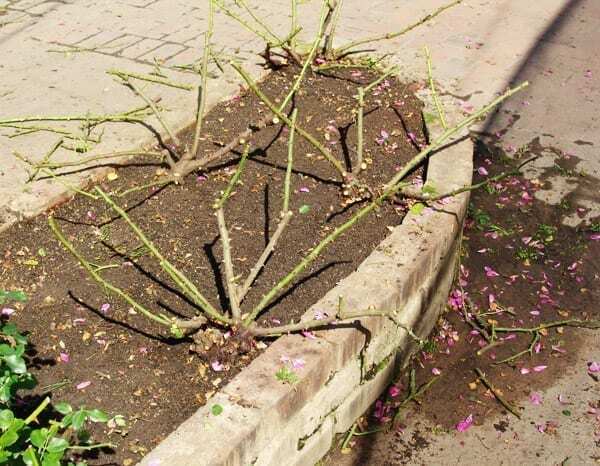 You can leave them unpruned, or simply tidy up at the base by cutting off obvious non-flower-bearing wood and stems. Since the bulk of the flowers are usually at such a height that one cannot see the detail of each bloom, the concern here is for profusion of blooms rather than individual quality. However, if you feel that the rose has grown out of hand, pull up a ladder and reduce the growth drastically, always bearing in mind that cutting back such a strong rose will result in even more new growth and, usually, fewer flowers. 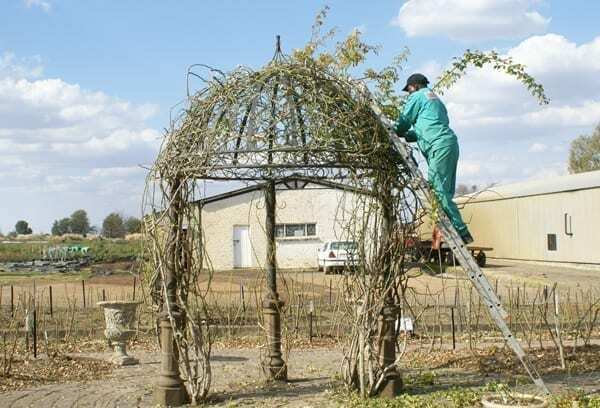 It is best, before commencing pruning, to remove all ties holding the long branches in place. Cut away older branches in favour of new ones and then tie back the remaining branches on to the fence, pole, pergola etc. The most spectacular show can be achieved by tying long, climbing stems horizontally on to a fence or wall. Again, all side stems are cut off next to the main stems. 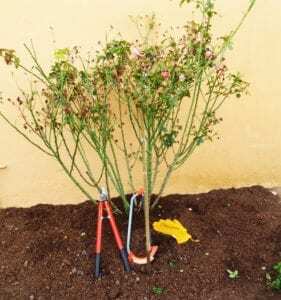 Another way of handling Climbers and also several of the large shrub and climbing types of English rose, is to bower the long canes and tie their tips at the base of the plant or on special pegs driven into the soil. If a Climbing rose in your garden does not flower, try leaving it alone. Some Climbers need two years before they have done most of their growing and are ready to start flowering. 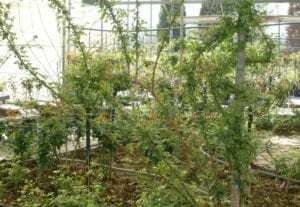 Pruning will encourage them to grow again, but not necessarily to flower. If this means that the rose is too large and unwieldy where you have planted it, and does not perform as you wish, take it out and transplant it to another, more appropriate spot, or give it to someone who has more space. There are two pruning options here. One is to chop off all stems about 10 cm above soil level and then to cut out the ground shoots, leaving about four. If the Miniature is grown as a specimen and has achieved a substantial height and width – about 80 cm high and wide – use hedge clippers to trim it by a third or half. Older, woody stems can be removed from the centre. 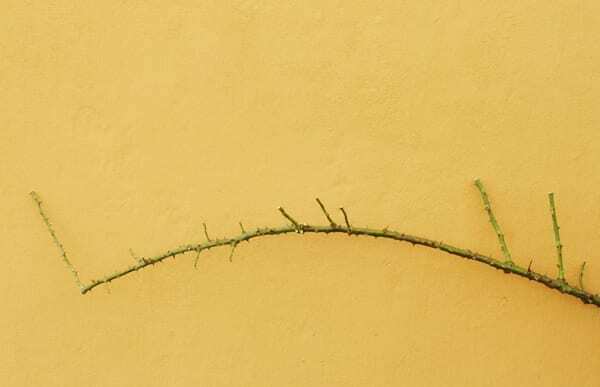 It is too time-consuming to prune the numerous little twigs. The rose will sort itself out and flower beautifully in spring. We do not expect large blooms from miniature roses, but rather an abundance of flowers. These grow into a dense, matted bush or low shrub. They can be left unpruned, but this might bring on red spiders early in the season. If weeds have become established amongst them, clip the roses well with hedge shears, and then remove some or all of the older wood, as well as the surrounding weeds. This variety is exceptional in that it is able to flourish year after year on old wood without having to renew itself from the base. This is why ‘Iceberg’ is able to grow into quite a large shrub and to flower every day of the season. No other variety matches this ability. Large shrubs of ‘Iceberg’ can be pruned lightly year after year and they will still produce the same quantity and quality of flowering clusters. However, if you wish your ‘Iceberg’ to remain a ‘tame’ bush that fits in with other Floribundas, prune in accordance with the instructions for Bush roses. 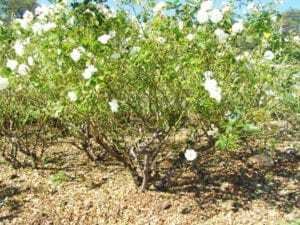 These are essentially Bush roses, and are pruned in almost the same way. However, do not use the measuring stick as described for Bush roses. Instead, cut back all stems and branches to about 50 cm of the crown or bud union and then remove all older wood and twigs. 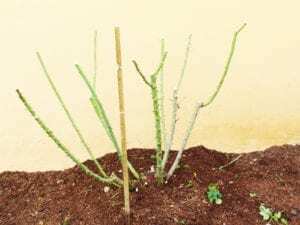 Final pruning should leave the stems about 30 cm long. Miniature Standards are obviously cut even shorter unless they, too, are expected to perform as small shrubs. 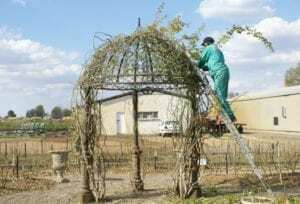 Umbrella Standards are also tidied up by cutting off all the side stems and twigs and by shortening the arching canes. Watch our videos on how easy pruning really is by following this link!